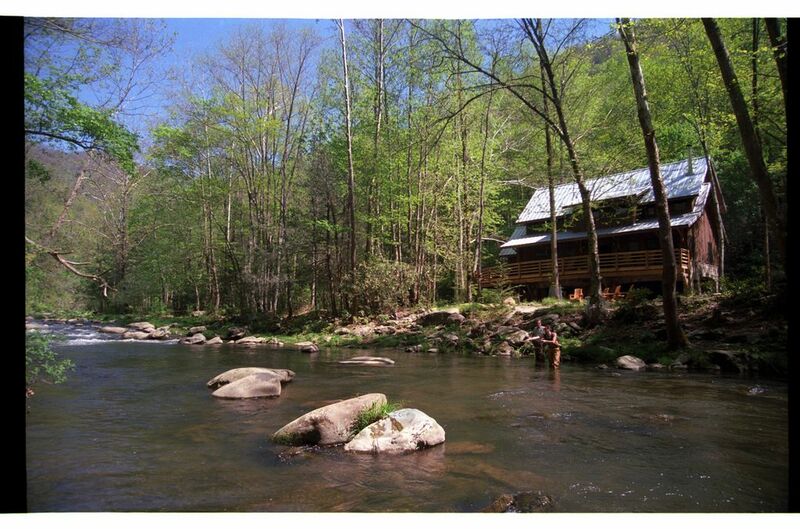 YOU HAVE FOUND THE PERFECT CABIN ON THE NANTAHALA RIVER NEAR BRYSON CITY! Nantahala River Lodge is a unique riverfront cabin on the Nantahala River. It is a rare and magnificent opportunity to have the rushing river a few steps from your front door. The Nantahala River Lodge offers privacy, an outstanding location, luxury accommodations, world class fishing and so much more. We custom designed and built our cabin with reclaimed wood from our family's North Carolina cabins and barn. Native stone was used inside and out. We furnished our home with handcrafted furniture and transformed family heirlooms into art. Every detail was carefully considered as we blended our family history into the creation of the Nantahala River Lodge. The Lodge offers accommodations for up to 8 people. Every room offers a view of the river. We encourage you to open the windows to bring the soothing river sounds indoors. 1400 feet of Nantahala River frontage, World class fishing just a few steps from the door, Luxury accommodations, Fully equipped kitchen to make cooking easy, Campfire area complete with stone benches around the fire pit, picnic table, grill and campfire wood, Easy access to area attractions, Privacy, Natural landscaping and so much more. The Nantahala River Lodge is our home away from home. We are very familiar with the area and are happy to share our local knowledge with you. Couples, families, friends and fishermen, whitewater enthusiasts and those who just want to relax and experience the beauty of the majestic Nantahala River and the Great Smoky Mountains will discover the Nantahala River Lodge is an unforgettable place. Mickey's grandparents came to this area for their honeymoon in 1921. It has been a long standing tradition to enjoy and care for this area. We've been making memories and friends here for three generations. We can help our guests make the most of their vacation. We love the Great Smoky Mountains, especially the uniqueness of the Nantahala Gorge. We were thrilled to build our home on the banks of the Nantahala River. We have learned through the years that each of the 4 seasons is indeed distinct, unique and wonderful. We love listening to the sound of the river. It's also nice to fish and swim in our front yard. The Lodge is located on a Scenic Byway and has very quick access to all of our favorite activities. Cell service available through some providers. Other Internet services available at locations nearby. Our dining table seats 8. Property borders river, has local fora including rare native plants. There are many outfitters in the area. Boat rentals available at nearby marinas and USCG licensed Captains are available for fishing and tours. 1400' of riverfront property, campfire & picnic area, hammock by the river, fenced property and so much more! Firewood provided! The Nantahala Outdoor Center offers our guests a 10% rafting discount. Discount vouchers to the Biltmore Estate are provided. Within walking distance of the Nantahala River Whitewater Launch site, the Bartram Trail and a paved pathway that winds along the Nantahala River. Area lakes and waterfalls only minutes from the cabin. Fishing guide service and instruction available. Near Bryson City.